Home » Entertainment » BOOK REVIEW: 'Keys to the Kingdom': Osama bin Laden -- Yeah, That One -- Masterminds Nuclear Attack on U.S.
BOOK REVIEW: 'Keys to the Kingdom': Osama bin Laden -- Yeah, That One -- Masterminds Nuclear Attack on U.S. 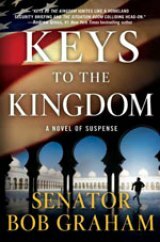 It's unfortunate for author Bob Graham that Osama bin Laden was killed in May 2011, because he pops up alive and well and planning evil deeds in 2012 in Graham's just published novel of suspense "Keys to The Kingdom" (Vanguard Press, 320 pages, $25.99). 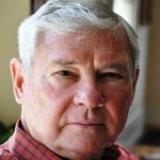 We know that it's at least 2012 in the thriller because it's an election year and former Senator from Florida (as is Bob Graham) and co-chair of the 9/11 Congressional Inquiry Commission John Billington is killed in a hit-and-run vehicle accident near his Florida home. Before his death, which isn't an accident, Billington left his former aide Tony Ramos detailed instructions for an investigation into suspected Saudi Arabia complicity in 9/11. That's not far from allegations about Pakistani complicity in hiding Osama bin Laden a few miles from a Pakistani army base and the capital of Islamabad. Tony, an Afro-Cuban, was a 1980 Mariel refugee from Communist Cuba as a toddler and he has served his adopted country well as a Special Forces operative and as an intelligence analyst in the State Department's Bureau of Intelligence and Research (INR). He's drop-dead handsome and was a top-flight tennis star at Georgetown University in Washington, DC, where joining the ROTC program led to a commission as a second lieutenant after graduation. Since this is a political thriller, there has to be dollops of sexual attraction and, in Tony's case, it's Treasury Department analyst Carol Watson, a beautiful blonde, his off-and-on love interest. She's investigating money laundering in the Caribbean, which could have links to Middle East terrorists. There's another beautiful woman in the novel's mix, Sen. Billington's celebrity photographer daughter Laura, who helps Tony in his efforts to uncover an international conspiracy linking the Saudi Kingdom to Osama bin Laden, a native of the country, and al-Qaeda. The terrorists plan to use the ultimate weapon, nuclear devices, two for overseas targets and one, the big one, for the greater Los Angeles area. As I said in the opening of this review, it's unfortunate that OBL plays such a major role in the book, because it's a very well written thriller with plausible plot points. We have alliances in the Middle East, not allies, and countries will do what they perceive is in their interests, as is evidenced by the 1956 alliance of Israel, France and Great Britain in their war against Egypt's Nasser after the nationalization of the Suez Canal and the blockade of Israel. This war was fiercely opposed by President Dwight D. Eisenhower.